STAY 4 NIGHTS AND WE'LL WAIVE THE CLEANING FEE! This beautiful home is the perfect Couples Retreat. You’ll love the spacious master suite and open living room, dining area and kitchen. This home is complete with spectacular views, 2 gas fireplaces, deck with a grill perfect for enjoying the fresh mountain air and relaxing. 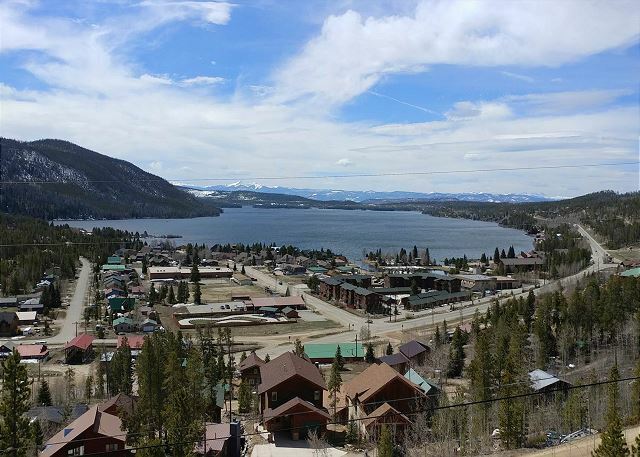 Sky Ridge is situated on a hilltop above historic Grand Lake offering spectacular views from the deck, living room and master bedroom. The gourmet kitchen blends contemporary stainless steel appliances with high end wood detailing perfect for preparing your favorite meals. Step off the main floor into a cozy reading nook for a quiet escape. The living room and master suite are both complemented by a gas fireplace creating a warm atmosphere throughout. You’ll love the feeling of seclusion with the convenience of being minutes from town. PLEASE NOTE: THIS HOME HAS A STRICT MAXIMUM CAPACITY OF 4 PEOPLE. ONLY. Minimum Age Requirement to rent this home is 25. REQUIRES FIVE NIGHT MINIMUM STAY OVER 4TH OF JULY HOLIDAY. We look forward to seeing you again. Happy 2019! My wife and I love to hike, to see great theater, to kayak, and to relax. So why we would we ever stay anywhere else than Sky Ridge? 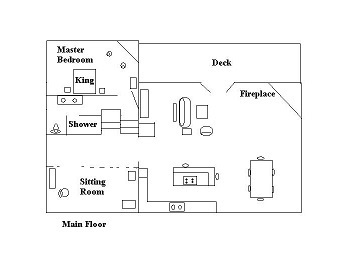 It's beautiful with great views, comfortable beds, perfect deck, stocked kitchen and professional service. You did pick the perfect place! Come back and see us any time. Beautiful Mountain Home, myself and my two daughters and one granddaughter had an excellent time and really enjoyed the home. We also enjoyed the town of Grand Lake and Rocky Mountain National Park. We saw a ton of wildlife. Including Elk, Deer, and Moose. The house had everything we needed to cook dinner one night and breakfast two mornings. Very clean and everything was easy to use! The homeowners left very specific instructions on how to use things in the house, which was nice! Definitely recommend this rental property to a small family looking for a nice mountain vacation. If you do plan on cooking I would say to bring all your food items from home or stop at larger grocery store before you get to the mountains, grand lake has 2 small food stores but the selection is limited. We're so happy you enjoyed yourselves and that the wildlife was so cooperative in putting on a show for you! We stayed in Sky Ridge 5 nights and loved it! The home is beautifully decorated with plenty of space for 4 adults. 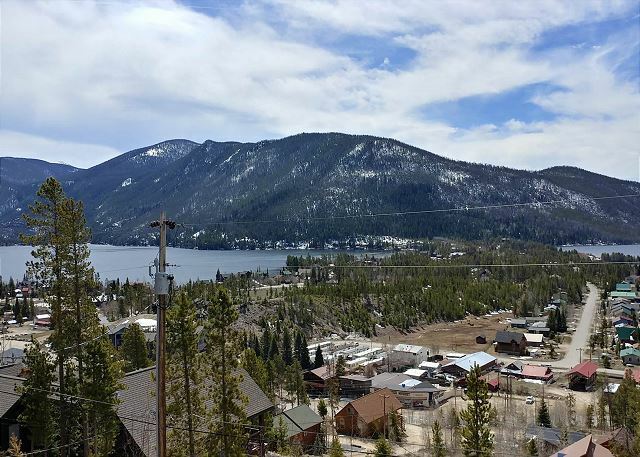 The view from the patio overlooks the town of Grand Lake, Shadow Mountain Lake and Grand Lake (the lake). The living room and bedroom furnishings were modern and comfortable. Plenty of items to use in the kitchen It was unseasonably hot while we were there and a fan (other than the ceiling fan) in the bedroom would've been helpful because the bedroom stayed pretty warm all week. 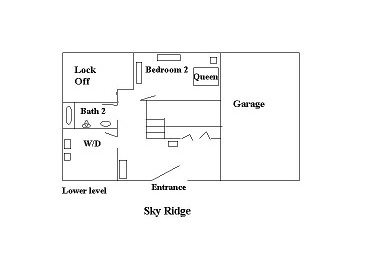 We will try to plan our vacation every summer around renting Sky Ridge. Highly recommended! Thanks Laura! Glad you had a good stay. Sky Ridge The perfect place. The home was perfectly clean. This was our second time to stay in this beautiful home. We couldn't figure out how to use the two tv remotes so we called for help and the manager came right out and helped us. We forgot to leave a note, but the night before we left, the upstairs shower only had hot water. I'm sure that can be fixed easily. We would recommend this beautiful home for anyone. Great time as usual. Always appreciate the ability to rent this home. Great views and very cozy. We absolutely loved this house and especially the beautiful view! You didn't even need to go outside to enjoy it! The house was like new and immaculate. It was a great home base to explore the national park. Thank you! Wonderful vacation home with two king bedrooms and two baths. Large gathering area and the dining table expands. (We had 12 around the table.) High end dining and glass ware, as well as multiple nice serving trays. Very well appointed kitchen. This home is very nice and very well equipped, one of the nicer vacation homes we have rented in some time.We really enjoyed visiting Grand Lake for the first time in 9 years and will definitely try to book this for our next visit! We are so happy you enjoyed your stay at Sky Ridge and we are so glad you came back to Grand Lake again! Looking forward to welcoming you back! laundry room,great views.hope we can stay there again. We were traveling with no pre-arranged reservations. When we arrived in Grand Lakes,we stopped in a realtors office who told us to inquire at Grand Mountain Rentals. In a matter of 20 min.we had a beautiful and comfortable place to stay. Outstanding customer service! Our family had a wonderful stay. The home was everything would could have hoped for and more. The views were amazing, especially going out onto the deck to view the stars! Would highly recommend to anyone looking to stay in Grand Lake. Would not hesitate to rent this beautiful home again. Was the best. Relaxing with great view and superbly apportioned house. Great place. Second stay and enjoyed it Immensely. Thank you for the great review. We are so happy you enjoyed your stay! Lovely home with a great view! Lovely home, spacious living space and master suite. Well provisioned kitchen with all of the tools you will need for cooking (pots, pans, utensils etc). The views were just amazing. The staff at the rental office was kind and very willing to answer questions etc. We will absolutely be back! Thanks for the great review. We are so happy you enjoyed your stay and, we agree, the views are amazing from Sky Ridge. You will have to come back in the summer when you can spend more time out on the deck! Looking forward to welcoming you back! Superb view cannot be beat! The wifi was fast, which is a plus in the mountains. Excellent hiking only a few minutes away. Kitchen cooking utensils could be updated, but not a big enough problem to detract from the stay. We enjoyed this property very much. Nice layout, beautiful deck, BBQ, and laundry. Just a gorgeous home with a gorgeous view! Could not have asked for a better stay in Grand Lake! Just loved it. Would come back here in a minute. Property managers were very helpful as well. Many thanks for the nice review. Hope you can come back at stay here again! Excellent! Beautiful House with a great view! So happy you enjoyed Sky Ridge! Hope you come back and stay with us again! We stayed at Sky Ridge for four nights and could not have asked for a better experience. It was clean, well stocked with household necessities and had an amazing view. It's right there in Grand Lake and while I wouldn't suggest walking because of the hill it's on, especially at night, it's a 2-3 minute drive to anywhere in town. I'm not sure I'll ever be in Grand Lake again, but if I am, I would absolutely stay at Sky Ridge. Stephanie, thank you for the great review. Sky Ridge is an awesome home with an awesome view! We hope you do get back to Grand Lake and please stay with us again! We loved the place! Great layout, clean and well appointed. Beautiful view. Thanks for the nice review, Daniel. We love Sky Ridge also and are pleased that our guests love it too! Glad you enjoyed staying at Sky Ridge, Lee! Come back again soon! Very good. It was bitter cold and the thermostat being on the lowest level made it a little difficult to keep everyone happy on the top floor. Otherwise, a great home and view. The pics do not do this place justice. The views from the deck are breath taking! Very private and quiet. The staff was very helpful and responsive with the rental. The house was spotlessly clean and well-provisioned for cooking. It even had basics like olive oil, salt and pepper, some spices. I didnt think I'd like the gas fireplaces but they were actually great. The view was incredible. It was quiet. We were there to hike, sightsee and relax. This home is perfect for that. There were good instructions on trash removal (you put your trash in a locked bin to prevent bear dumpster diving- routine for mountain residents but not for your Ohio suburban dweller). Really I am hard pressed to come up with any negatives about this rental. I would definitely come back. Thank you! Beautiful home with great views of Grand Lake and Shadow Mountain Lake. Amazing views of the fall foliage and the firework display over Grand Lake made the house a perfect choice for the fall weekend getaway. The staff at Grand Mountain Rental did an exceptional job assisting us to arrange our trip. Family had a great stay. Views are amazing. Definitely a repeat rental for us. Just a wonderful time. Beautiful house More than probably represented. The ladies at Grand Mountain rental were tooooo good. They helped with local people and attractions. The Chamber of Commerce needs to hire them, or at least pay them!! Sky Ridge is a gorgeous home. It was immaculate. We did have trouble finding it at first because there is no street sign,but that isn't your responsibility.We would definetly recommend this property.We do have one suggestion,since the refrigerator did not dispense ice,an ice tray would help. We just went and bought a bag of ice.We ate at the Sagebrush and shopped in almost all of the stores. Sky Ridge and Grand Mountain Rentals came through,as always!! We are glad you enjoyed your stay at Sky Ridge! We will check out the ice problem with the refrigerator. We look forward to seeing you again in the future. Amazing views and close to town.